The ITV show tried to send her to rehab and she said, yes, yes, yes. Breakfast TV presenters Susanna Reid and Piers Morgan return to ITV’s Good Morning Britain from Monday. Richard Madeley, Eamonn Holmes and Jeremy Kyle will guest host Good Morning Britain this summer, ITV have announced. The stars of ITV’s morning schedule have filmed a new promo which begun airing over the weekend. 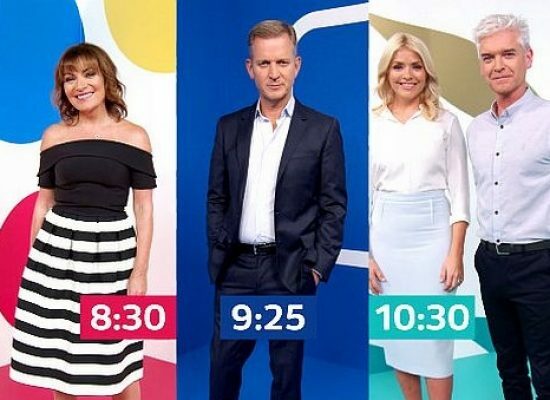 Personalities from Good Morning Britain, This Morning, Lorraine, Loose Women, The Jeremy Kyle Show, Tipping Point, The Chase and Judge Rinder have come together in an ITV Daytime promo which sees them all attempt to hop aboard a hot air balloon – some with more success than others. A star-studded Text Santa returns to ITV, STV and UTV screens later this month and one again the famous, festive faces are all in their Christmas jumpers. Problem solver Jeremy Kyle is to take on Channel 4’s Embarrassing Bodies with his own illness solving show for ITV. Husband and wife team Eamonn Holmes and Ruth Langsford are to host a debate series for ITV. Text Santa specials will air during ITV daytime schedule later this week including features on Daybreak, Jeremy Kyle and This Morning. ITV is to air a 90-minute celebration of their famous Quay Street studios in Manchester as they wind down after nearly sixty years of television production in Goodbye Granadaland.